Did you know June is National Rose Month? Roses have a long and colorful history. They have symbolized love, beauty, war, and politics throughout centuries. The Rose itself has been dated back to 35 million years old and its current family tree contains 125 different species of roses occurring naturally throughout the Northern Hemisphere. In celebration of National Rose Month, we’ve compiled a list of the most common rose diseases/pests in our area and their symptoms so you can know what to look out for. 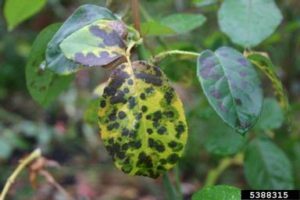 Blackspot also known as leaf spot and leaf blotch is a dangerous fungal disease for roses. This fungal disease is spread through splashing water and tends to infect trees during rainy periods. If left untreated, rose bushes will become defoliated, weak, and susceptible to other diseases. Also called witches broom disease, rose rosette, is becoming more common and can cause significant damage. Not much is known about this pathogen but it’s thought to be spread by a certain type of mite. Affected plants can’t be cured so removal is recommended. Witches’ broom – development of tufts of small, deformed reddish leaves & excessive thorniness. 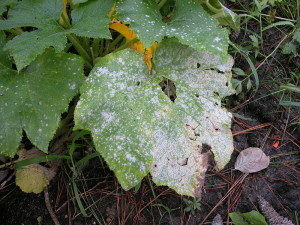 Spots/patches of white to grayish, talcum-powder-like growth on the upper side of leaves. Homeowners that grow knockout roses have it a little bit easier than the rest of rose growers because of their resistance to fungal diseases. However, they still have issues with the common rose insects listed below so make sure to still inspect them on a regular basis. 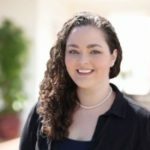 Need Help With Rose Diseases/Pest? 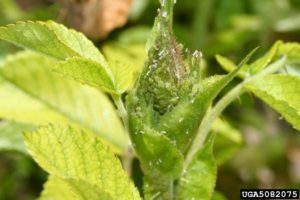 Aphids, also known as plant lice, will likely be found on new shoots and buds. These plant-sucking insects feed on the sap of a tree or shrub. Their excrement, referred to as honeydew, is commonly mistaken for sap. Aphids are most active in spring and summer. If not treated large infestations can slow the growth of the plant, ruin buds, and deform emerging leaves. Learn more about Aphids. Japanese Beetles are most prevalent from June through August and can defoliate a rose bush in a matter of days. These beetles are skeletonizers, which means they feed on leaf tissue leaving only the veins behind and in heavy infestations the entire tree can be affected, tuning all leaves brown. 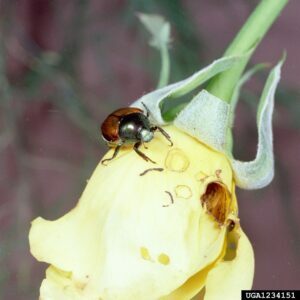 These beetles tend to congregate in large numbers on rose flowers, chewing holes in flower buds, petals, and foliage. Learn more about Japanese Beetles. 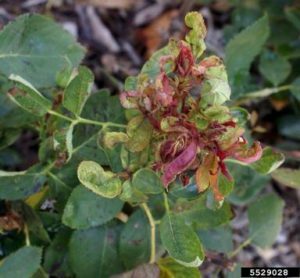 Spider mites are a common enemy of anyone who cares about their roses. Classified as arachnids, these tiny tree bugs are less than 1/20 inch long when fully mature and look like moving dots to the naked eye. Their ability to rapidly reproduce allows large populations to develop fast and severely harm your roses before you even realize you have a problem. 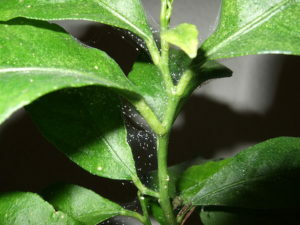 Learn more about Spider Mites. Sawflies despite the name are not flies at all; they belong to the wasp family and can completely defoliate your rose bush in a few short days. 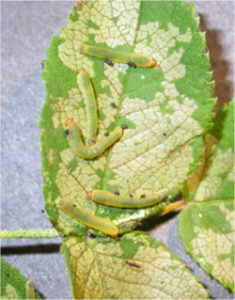 The sawfly larva is actually what feeds on trees and plants causing damage. Larvae tend to look like caterpillars with three large legs and seven smaller false legs. Although they may appear individually they are typically seen in groups that feed on the leaves and needles of plant life. Learn more about Sawflies.